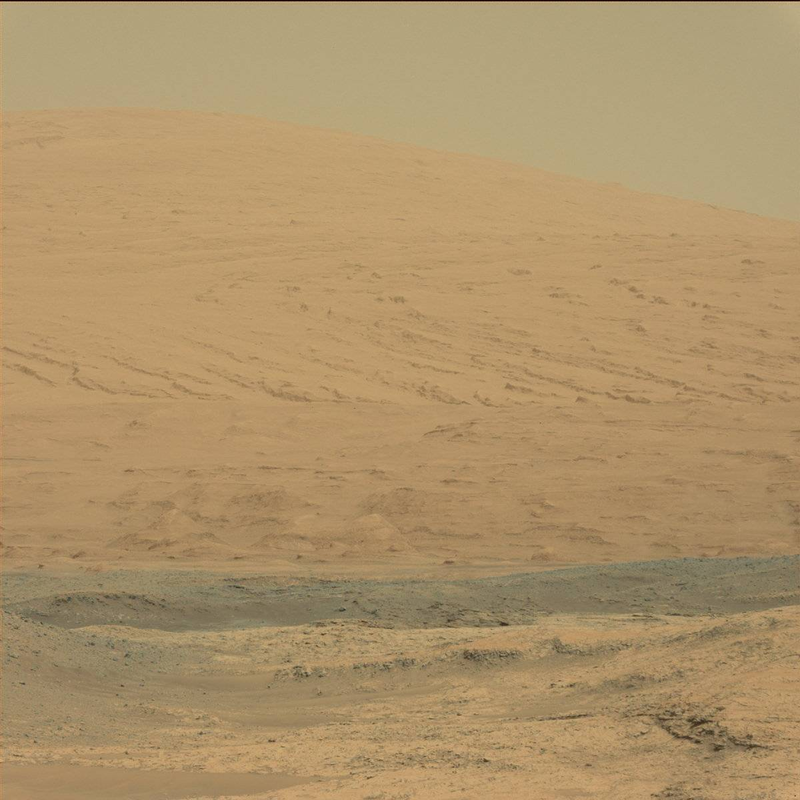 ols 751 through 753 this week promise some exciting new imagery from Curiosity. Already published to the Google Earth archive is the latest telemetry from Sol 752 (taken yesterday) which will be used to create a further upload (I’m separating the presentations into two files for this event; one called 752a, the other, 752b). These will illustrate further a detailed look at the geography of the region now being called simply ‘the Amargosa Valley’. Edgar promises further science mission plans for the Pahrump Hills region and beyond will be known very soon. esterday, we again saw numerous spending questions about the value behind #Curiosity and other endeavours by #NASA concerning space exploration. These were prevalent amongst the media’s questions during a Curiosity Update event sponsored by the Jet Propulsion Laboratory (#JPL). 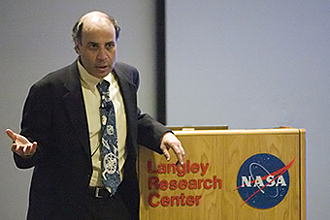 Dr. Robert Zubrin speaking at NASA in 2008. Earlier this month, similar frustration could be heard reverberating from the Mars Society’s Dr. Robert Zubrin, who (ensconced atop his pulpit at NASA’s Ames Research Centre) aggressively critiqued the high-profile US department for vacillating on its exploration objectives throughout the solar system. Zubrin and others see an inefficient, navel-gazing, visionless bureaucracy requiring a refocusing of goals and research to end years of wasted money and energy spent on justifying bad programs. Instead, what seems to be happening is the very same political institutions responsible for funding US space exploration are simply cutting an inefficient image-conscious government department without addressing the real problem behind invested dollars being well-spent. In the meantime, corporate America (and commercial interests elsewhere) have begun to step into the sacred ground once reserved for NASA. Cancellation of the Constellation project happened in tandem with the government refocusing its spending on backing commercial exploration, no doubt because of NASA’s inability to get the job done soon enough to put America first in a second emerging space race. But NASA still has missions all over the solar system to manage and maintain — and its not clear where the money will come from if the larger issues affecting it aren’t addressed. In the end, maybe a few heads have to roll. And there will be consequences; but the only alternative is continuing to stand idly by and watch an organization that once led humanity to the surface of the moon fade from relevance entirely. Databases menu appears, with “Default” radio button selected. Select menu icon, top-right-hand corner of UI. Enter Database URL dialogue box appears. Enter http://khmdb.google.com/?db=mars into the dialogue’s textbox and click ‘OK’. The database address now appears beneath “Default” in the databases menu with its radio button selected (make sure). Click the ‘back/return’ button from the phone’s UI (at the bottom, in the Android version). Google Mars should now be visible. 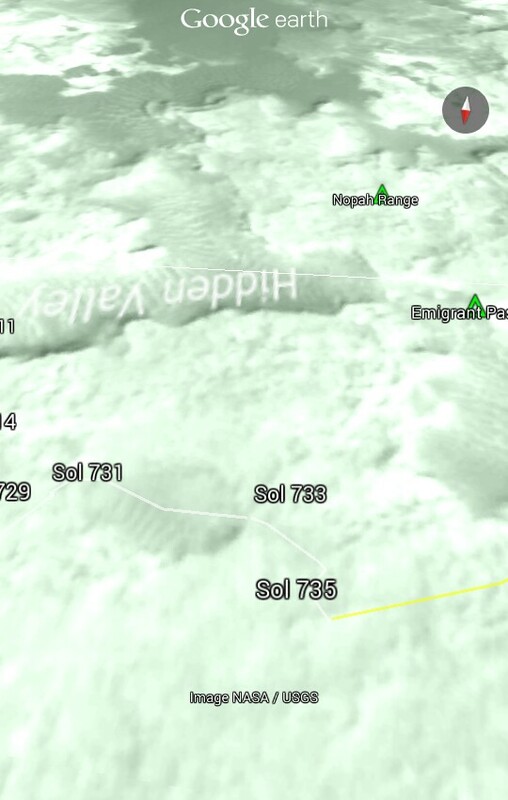 Return to the smartphone’s browser & visit the Curiosity Rover data page: http://ross613.apprefactory.ca/mars-curiosity-rover-msl-in-google-earth/. Click the entry for the current Sol & select the Google Earth app if/when prompted to select a smart phone app to load the data with. The Google Earth app should automatically centre Google Mars on the location of the latest data summary. NASA: ⅔ of Earth’s Ice Cap Now Gone! lthough headed for a low, but not the usual “record low” year of ice loss, NASA has now been able to assemble the available evidence and state definitively that our tiny, blue planet is in the final stages of losing the northern arctic ice cap completely. 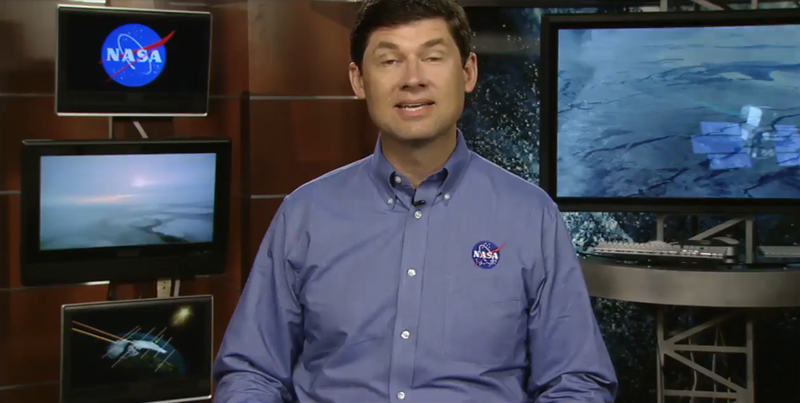 A video released on Space.com this morning shows Dr. Thomas Wagner of NASA HQ, Washington, DC discussion various aspects of the NASA’s ARISE mission and the means by which the supporting data was acquired. The report is of serious concern, of course. But I find it pretty remarkable just how incredibly fast the artic ice cap has, first, disintegrated and then virtually melted away. The only good news in the piece was that the shrinkage this year isn’t a record low….but that doesn’t mean the overall trend (being year-over-year record loss) has terminally halted. My guess would be that it could be an indicator things might have started to slow down slightly — but it’s too little, too late as far as the arctic ice cap is concerned. Next, I suspect we’ll be hearing about he subarctic cap disappearing completely. And…I now wonder if any of it will be left by 2020! Guess that tells us not only how carefully CNN edits its content — but how much they bother to consult their readers’ comments on the articles they publish! ox News has gained plenty of notoriety for injecting inflammatory rhetoric into its news coverage in recent years, but after seeing this recent video on the heels of watching coverage of Atlantis’ return to Earth at the end of the final shuttle mission, it seems the aim here is to turn the event into yet another political football. The claim being that, unlike Kennedy, Obama is ending manned spaceflight in the U.S. to save money. But, as is almost always the case where Fox commentary is concerned, there’s really more to the story. Still, one needs to concede that were the U.S. not sinking into a financial abyss at the moment, there’d likely not be any particular will to end shuttle flights during the hand-off to commercial enterprise; regardless of the arguments about how NASA’s presence in the open market would have made commercial manned spaceflight much less viable. But SpaceX has already demonstrated that, flying an unmanned empty capsule aboard its Falcon 9 rocket, it and other companies are today much closer to having the capability to take over from NASA because of the decision to take it to the private sector. NASA provided funding for some of SpaceX’s efforts as it is doing for 4 other companies which stand close to getting their own spacecraft off the ground. In fact, I’ve seen a similar move before by government agencies with respect to privatization of previous government monopolies. At the dawn of the Internet era, there was only a single ISP in Winnipeg, Manitoba (my home city). A fellow named Bill Reid who directed the University of Manitoba’s (U of M) Computer Services department made a decision to take the Internet private. Why wasn’t business doing this on its own? Well MBNet (the ISP’s name) was offering dial-up access for free to students of the U of M and for an extremely low rate (base annual fee of $25 per account¹) which made private ISP service all but unviable. But when MBNet kicked all its users off (or almost all) one fateful day, companies like Magic Online Services (later purchased by TotalNet of Montreal) stood ready that very day to offer service to the public. At the time, there were those that saw MBNet’s move as being unfair – many were forced to make significant changes to their networking services in a very short period of time. But at some point, stepping back was surely the right thing to do lest Winnipeg and even the province of Manitoba more generally make competition in the Internet services market a game played strictly by very large companies. (Indeed, the market’ has largely gone that way in any event, but it’s quite possible the current situation would have been much worse.) 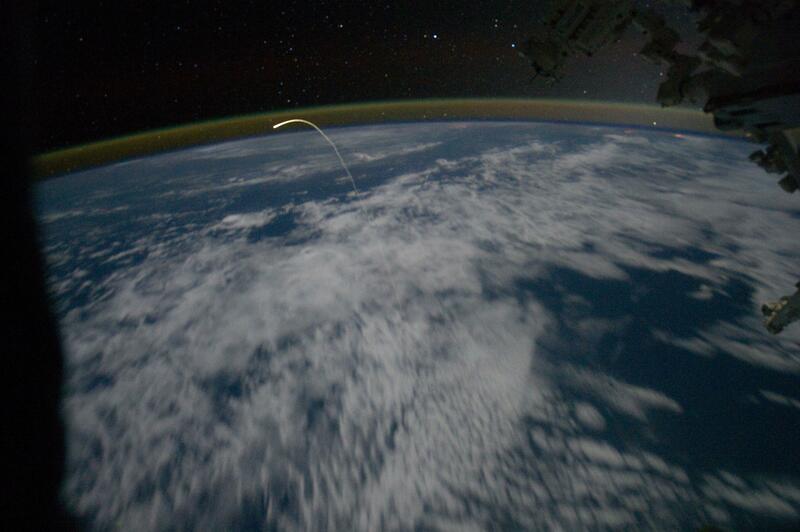 And I see the same being true for a much broader set of reasons where NASA is concerned. Time will tell, of course — but at the very least Obama and the NASA administration shouldn’t be faulted for this effort. The U.S. is experiencing a serious financial crisis and there’s little doubt even from the decision’s detractors that the private sector can ultimately do spaceflight more cost-effectively. And at this point in history, surely that’s enough reason to make it a private concern…particularly when there exists a real possibility the U.S. won’t be able to afford manned missions on its own if steps aren’t taken to redress the crippling U.S. deficit. Steps exactly like this one. Indeed, one could well argue that this move will preserve manned spaceflight in the years ahead; and that not privatizing manned missions to space would threaten the continued ability of the U.S. to undertake such challenges. Perhaps even threaten the existence of NASA as an agency of manned exploration anywhere but in historical texts. Hopefully in the long run, those on Twitter who’ve thus far spared the time to barely read the lead into neocon-authored editorials will eventually find time to hear the full story. Of course, there are a few other obstacles that stand in the way of that: the realization that a previous Republican administration deregulated the financial services sector and started a war with 2 countries creating a situation where decisions like this were inevitable. And I’m not sure that message will ever get the kind of reception necessary for Twitter-bound hecklers to cease their de facto campaign of complaints re #nasa. But the taste of the last shuttle’s return to Earth would sure be less bitter for it if they did. ¹ An original document containing MBNet’s fee structure was located while doing research from this story. Based on my memory of extensive prior MBNet usage, I can testify its authenticity.